Collecting lady bugs, worms, catching fireflies….did I trigger a childhood memory for you? I know a few cam flashing back for me. I think all kids love collecting bugs at some time and with Nancy B’s Science Club Bug Discovery Lab and Insects Journal kids are all set for their bug catching and discovering adventures. *Built in magnifiers for great specimen viewing. *Breathing holes for longer viewing of bugs. The Bug Discovery Lab is great for kids to get out exploring and learning. 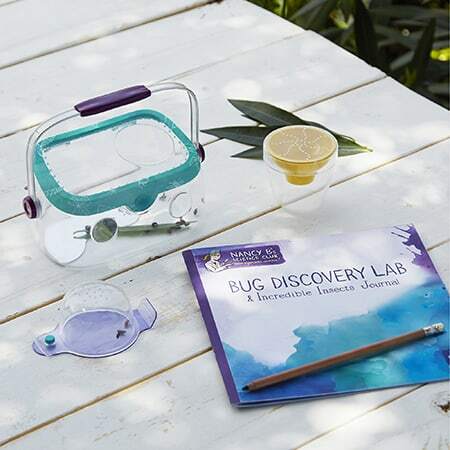 It is a great discovery lab to bring on walks to the park, camping, or anytime in the backyard that kids want to go exploring and catching bugs. Please make sure to have your kids release the bugs when they are done learning. Also, remember to not leave the Discovery Lab out in the sun. The bugs will get too hot and die on you. There is an entire lineup of Nancy B products that all encourage young scientists to get out exploring and learning. We have reviewed a number of the Nancy B products and they have never let me down. I find that they are always well made and encourage young scientists to explore and learn.